The Association of Theological Schools states, The purpose of the Doctor of Ministry degree is to enhance the practice of ministry for persons who hold the MDiv degree and have engaged in ministerial leadership. The goals an institution adopts for the DMin should include an advanced understanding of the nature and purposes of ministry, enhanced competencies in pastoral analysis and ministerial skills, the integration of these dimensions into the theologically reflective practice of ministry, new knowledge about the practice of ministry, and continued growth in spiritual maturity ... The program shall include the design and completion of a written doctoral-level project that addresses both the nature and the practice of ministry. The project should be of sufficient quality that it contributes to the practice of ministry as judged by professional standards and has the potential for application in other contexts of ministry. Doctor of Ministry projects are a type of participatory action research that introduces an intervention in order to provide ministerial leadership for the transformation of the organization. 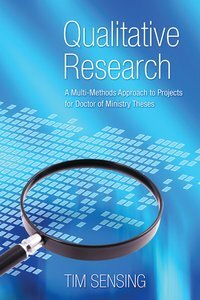 The intent of Qualitative Research: A Multi-Methods Approach for Doctor of Ministry Projects is to provide the fundamentals of qualitative research so that significant projects and theses emerge. Tim Sensing (DMin, PhD) is the Director of Academic Services and Professor of Homiletics at the Graduate School of Theology located on the campus of Abilene Christian University. Tim has taught research methodologies for the Doctor of Ministry program since 1999.